"Don't run away. Walk on." Memorable Moment - I like this movie, even if it is predictable. Meryl Streep is fantastic as usual and it's nice to see her acting alongside her daughter Mamie Gummer. Because that's what this film is all about - motherhood. Getting it right and getting it so very wrong. 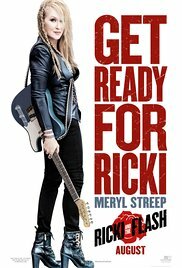 Meryl's character Ricki is a rock star, but she's also an absent mother; something her three children resent in their own ways, even as they long for a relationship with her. We all need our mothers, after all. Mamie plays Ricki's daughter Julie, who is going through a tough time. At one stage Ricki says to her "Don't run away. Walk on", which really struck a chord for me and is the scene I've chosen as my memorable moment. We've all been through things in life, suffered through stressful or tragic events, and it can be hard to carry on when we feel so beaten down by life. What Ricki says to Julie reminds me of that famous adage 'This too shall pass' - I always try to keep that in mind whenever I'm struggling in life. Bad times happen to all of us, but if we keep facing the day, stop ourselves from running away when things get rough, if we remember to simply "walk on", to just keep going, the hard times will pass and happiness will find us again. When you're feeling down, let yourself feel those emotions; don't run from them. But also - don't run away from life either. Hold on to the hope that things will improve. Stay strong. Walk on.